“Elvis Week” is being celebrated all over the country. 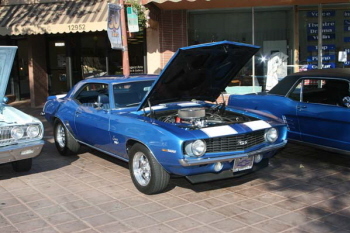 Main Street, Garden Grove has had a car show every Friday night for the last 12+ years. The biggest restaurant on Main Street is Azteca. The owner of Azteca is a huge Elvis fan. 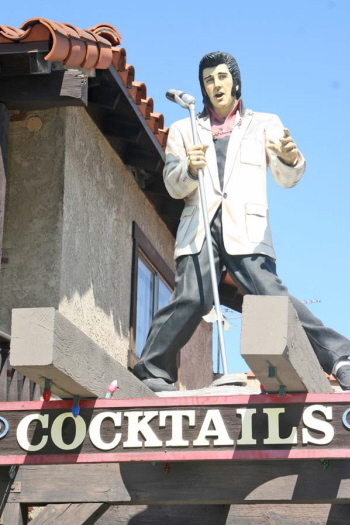 The restaurant and bar is an Elvis shrine. 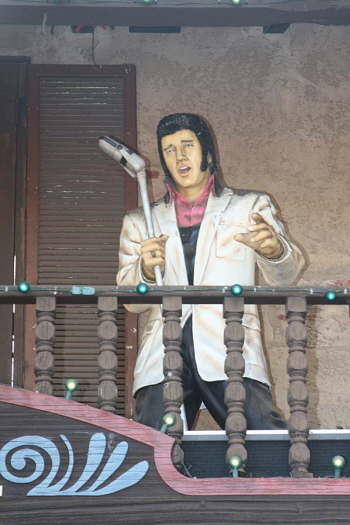 This Friday night Special Elvis Show features an Elvis impersonator, several look alikes and lots of souvenirs. This year is also the 50th anniversary of the City of Garden Grove. The heat of the day gives way to the perfect evening temperature. 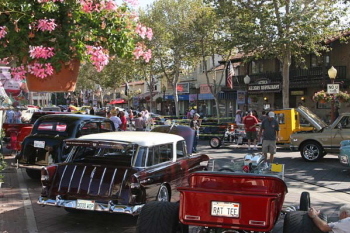 The picturesque Main Street was full of Hot Rods and many of the 100+ cars had to park in an overflow lot. The evening ends with lots of awards, prizes are won by lucky ticket holders, and the 50/50 winner got $500.! 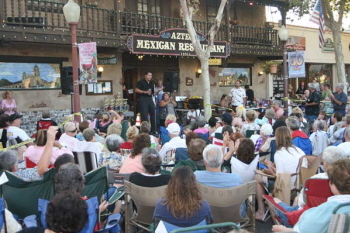 “Elvis” invites fans into the Azteca Restaurant year round. 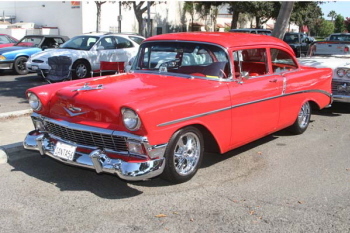 This very clean ’56 Chevy 210 has original 283 Chevy power and belongs to “Santa” Bob Thompson of Anaheim, CA. 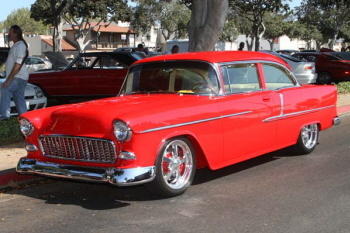 This immaculate ’55 Chevy Belair rides on a Corvette chassis, has LS1 power, and Ron Mangus upholstery. 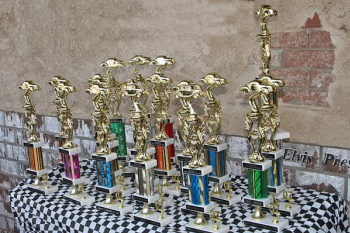 It won the “Best GM” award for Glen & Caroline Kanos of Huntington Beach, CA. 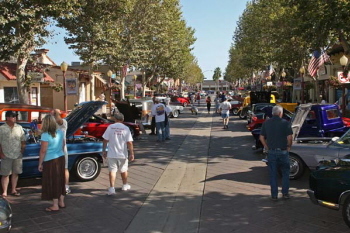 Scenes of picturesque Main Street, Garden Grove full of Hot Rods. 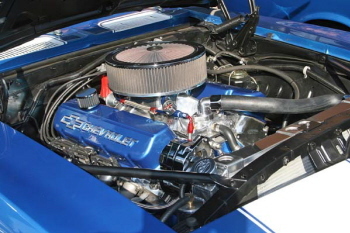 This sharp ’69 Chevy Camaro has a badge in the grille that says “SS” and another badge on the front fender that says “502”. Which one of those badges was stock in 1969? Lots of awards for later. 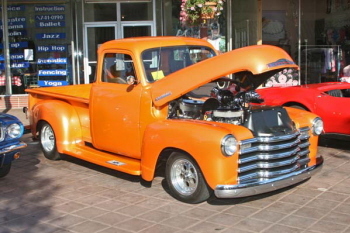 This ’48 Chevy Pickup is nice to look at. It came from Trabuco Canyon, CA with Tim & Nancy Timmerman. 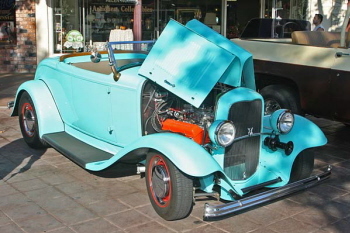 Interesting color combination on Don Simpson’s Deuce Roadster from Orange, CA. Check out the cool Merc Hubs. 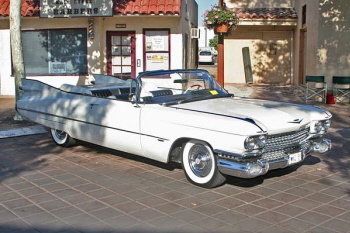 This award winning classic, long, low ’59 Cadillac Convertible belongs to Toni Echt of Buena Park, CA. What’s INOT? 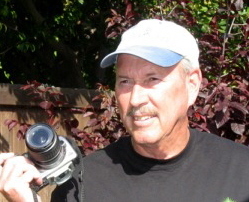 Joe Camuglia of Laguna Hills, CA. 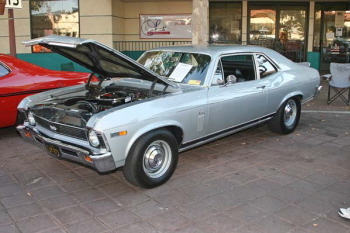 is the original owner of the silver ’69 Chevy Nova SS. Great story guys! No, it’s not a Plymouth. 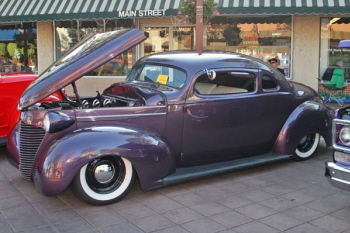 Alex Utria’s ’39 Hudson 112 Coupe is a very well done “work in progress”. 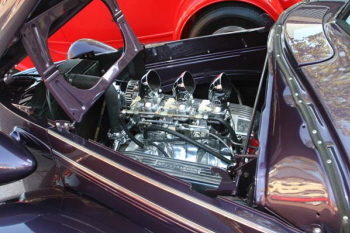 Everything so far is exceptionally detailed including the 425ci “nailhead” Buick with tri-power. Keep up the good work! 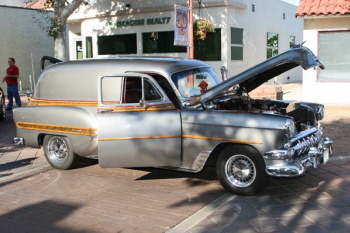 All the modifications and customizing on this rare ’54 Chevy Sedan Delivery was done by owner Bob Knerr of Orange, CA. 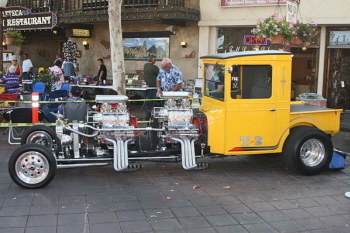 This award winning very detailed ’25 Ford “T” is powered by twin blown 383 Chevy small blocks. This has to be an interesting ride. 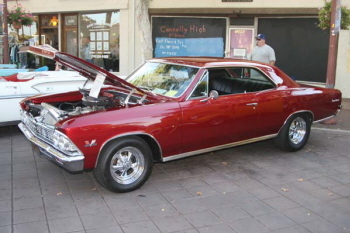 A clean ’66 396 powered Chevy Chevelle SS. 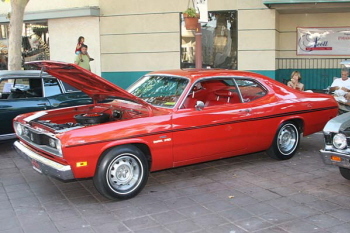 The owner is Denny Henderson from Orange, CA. Barry Grant of Anaheim, CA. 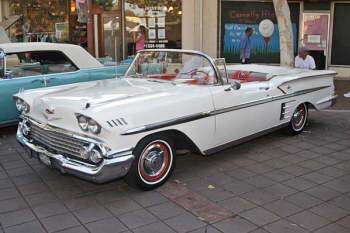 brought his, very original, ’58 Chevy Impala Convertible with 348 Chevy power. The crowd gathered around the stage as Mitch Rivers does his livley impression of Elvis. 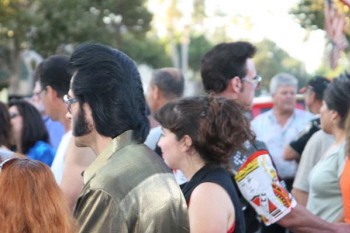 As you can see, other Elvis impersonators where walking around. 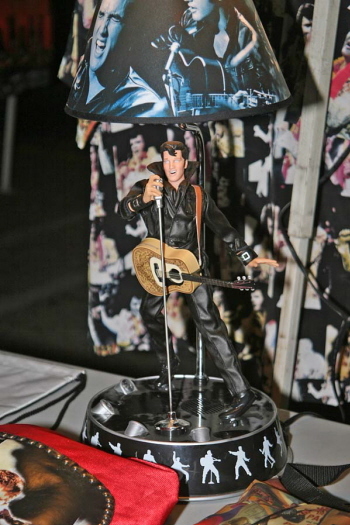 Anybody need a “Dancing” Elvis lamp? 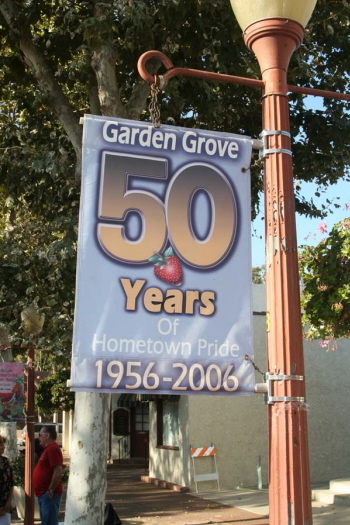 This year is also the 50th anniversary of the City of Garden Grove. 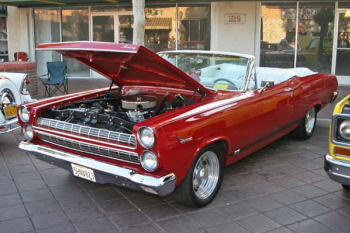 This classy ’66 Mercury Cyclone GT Convertible belongs to Konrad Emirk of Whittier, CA.